HAS ANYBODY FOUND DIFFERIN OR RETIN-A HELPFUL? I never liked Differin but Retin-A Micro worked wonders. I was on spironolactone though so I don't know which one gave me clear skin, maybe both. I used to get them. They hurt and made that part of my nose red and swollen, even though the pimple was inside my nose. It is usually not easy to pop them, it's kinda hard to pop something you don't see. (It was for me anyway) The only solution for me was to be patient and wait for it to heal. Some get cortisone shots for this type of cysts. Derms perform this and the cyst usually goes away in 24 hours. I don't have experience with it but my aunt got one for a huge cyst on her cheek and it worked. 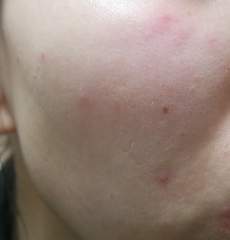 Does Minocycline get rid of moderate cystic acne?? The first time I ever went to a derm, minocycline was the first thing she prescribed along with a bunch of topicals. 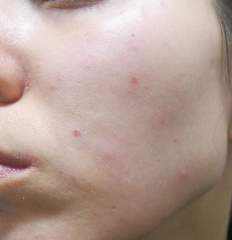 My acne is cystic and it was moderate at the time. Minocycline gave me clear skin for 6 months, but then she took me off of it and gave me milder topicals and the cysts came back. It might give you clear skin for a few months but it may come back once you finish your course. need some advice and encouragement ! Some people don't clear up until they are about to finish their course so don't be discouraged. Maybe your derm can prescribe an antibiotic to help with the inflammation. Spiro dries the skin out just like Accutane. So it may be some sort of overkill. I've had great luck with spiro. I used it with Diane-35 in the past and I use it with Yasmin now. Something to help acne only short term? Topical antibiotics might take a while to work. I think oral antibiotics do not affect the way BCP works hormonally, it only increases the pregnancy possibility rate. Some derms prescribe oral antibiotics with BC pills anyway. I guess a strong oral antibiotic might be a temporary solution but still it might take a month to work. The dosage is determined by body weight. I guess it is something like 0.5 to 1.0 mg/kg/day. (1 kg = 2.2 lbs) Taking less than this for a longer period of time work and seems like a popular choice these days since it makes the side effects more bearable. How many millagrams is considered as "low dose"
Hopps, the reply I wrote earlier was meant for another thread. I've been on spironolactone for 2 years. I also take Yasmin to prevent irregular bleeding. They did a pretty good job until I noticed a hard bump on my cheek yesterday. Today it is large, red and hard. A typical cyst.. Since I haven't had one of those in 2 years, I am shocked. What is going on? Should I expect more? Any spironolactone users had someone like this happen to them? I actually see no point in taking antibiotics for acne. Almost always (unless you don't grow out of it while taking antibiotics) acne comes back after taking them and even if you take them long term, the bacteria becomes resistant so it stops working.